Medicine cabinets are often a black hole of expired medications, forgotten prescriptions and unused products. Medicine cabinet organization can help you keep track of your prescriptions and keep your family safe from medication-related accidents. Hy-Vee Pharmacy Solutions (HPS) helps you get organized with this list of what to keep in your medicine cabinet and what to get rid of so you can live easier, healthier and happier. Many people have medicine cabinets in their bathroom, but that may not be the best location to store your medications. Dramatic changes in temperature and humidity are not ideal when it comes to medication storage. Consider relocating your medicine cabinet to a bedroom or another secure location for a more stable environment. Store your medications in a cool, dry location unless your pharmacist tells you differently. Wherever you store your medications, make sure they are secure and out of reach from children and pets. Make an effort to clean out your medication cabinet regularly and dispose of old medications and supplies. 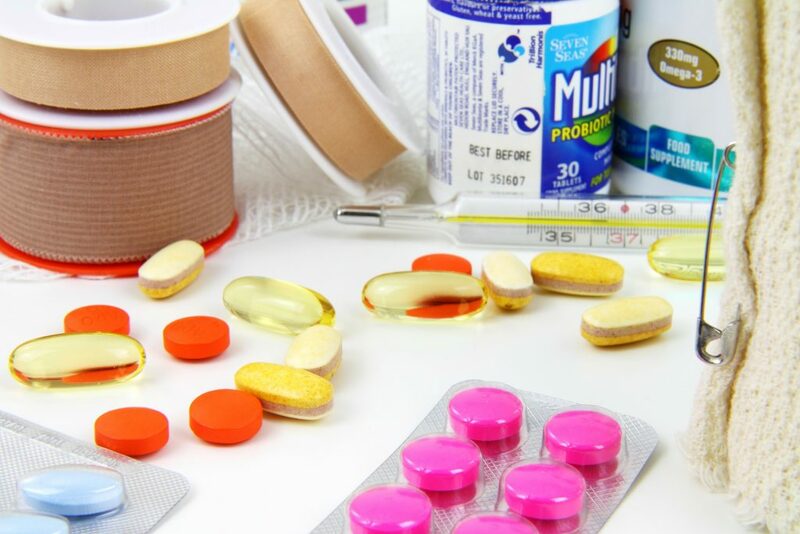 Acetaminophen and nonsteroidal anti-inflammatory drugs (NSAIDS) are common over-the-counter medications that can reduce fever and provide pain relief. Examples of common medications that include acetaminophen include Tylenol®, Midol®, NyQuil®, Exedrin® and many generic products. NSAIDS include ibuprofen, naproxen and aspirin. It’s a good idea to keep these medications stocked in your medicine cabinet to treat a variety of minor aches and pains. Ask your doctor or HPS pharmacist about the differences between over-the-counter pain medications, especially if you have stomach, kidney or bleeding conditions. You should also talk to your healthcare team before taking an over-the-counter medication daily for chronic pain relief. Some over-the-counter pain medications are not good for children, so ask your HPS pharmacist before giving acetaminophen or NSAIDS to a child. Antihistamines are a common ingredient in many allergy medicines and anti-itch treatments. Antihistamines treat many common allergy symptoms, such as congestion, sneezing, itching, hives and swollen nasal passages. Even if you don’t have allergies, it’s a good idea to keep antihistamines in your medicine cabinet. Oral antihistamines and antihistamine creams can provide itching relief after multiple insect bites. You can also keep hydrocortisone cream in your medicine cabinet for another anti-itch treatment option. Some antihistamines can cause drowsiness and make you sleepy, so be sure to ask your pharmacist about potential side effects. If you experience a severe allergic reaction, seek medical help right away. When you’re sick, you probably don’t want to go to the store for cold medicine. Keep over-the-counter cough and congestion medicine handy to treat common cold symptoms right away. Cough drops, cough suppressants and decongestants are medicine cabinet must haves. If you’re taking medication for another health condition, talk to your HPS pharmacist before taking over-the-counter cold medications. Many people also take vitamins or nutrition supplements to support their health. Talk to your pharmacist or doctor before taking supplements, especially if you are on other medications. Keep medicine to sooth your stomach and ease digestion readily available. Eating greasy, spicy foods or eating too fast can upset your digestive system. Calcium carbonate tablets, such as Tums®, Rolaids® and many generic versions, provide relief for heartburn and stomach acid. Tell your doctor if you have chronic constipation or diarrhea because it may be a sign of a more serious health problem. Some medications can upset your digestive system. Ask your HPS pharmacist about the potential medication side effects for your prescription. Every medicine cabinet should contain basic first aid supplies. A basic first aid kit should include all the necessary supplies to take care of cuts, scrapes and other minor injuries. Keep gauze and a variety of bandages in different sizes stocked and ready to use when you need them. The Mayo Clinic provides a thorough list of suggested first aid kit supplies so you’re prepared in the event of an emergency. Additional supplies to store in your medicine cabinet include a thermometer andtweezers. You should also have a dosage spoon or cup to measure and administer the right dose of medications. If you are taking a prescription medication, make sure to keep track of your supply. Having an organized medicine cabinet helps with that. It’s important for you to know how much medication you have so you know when it’s time to renew your prescription. If you’re an HPS patient, our team will contact you to remind you about medication refills or you can sign up for refill reminder text alerts. Label your prescriptions clearly to avoid confusion. Keep track of what time and how often you take your medication to avoid a missed dose or an accidental overdose. Always store your medication in secure containers and keep them out of reach of children and pets. Take your entire prescription as directed. If you have leftover medication, talk to your HPS pharmacist about how to dispose of it safely. Go through your medicine cabinet regularly and dispose of expired medications, cosmetic items and other old products. If something changes color, has a different consistency or doesn’t seem right, play it safe and get rid of it. Check the expiration dates on everyday items such as sunscreen and toothpaste. These products and others are not as effective past their expiration date. If you have questions about medication expiration dates, ask your HPS pharmacist. Some medications can be potentially harmful for the environment. Check the Food and Drug Administration (FDA) guidelines about how to get rid of unused medications safely. Ask your HPS pharmacist about the best way to dispose of your medication. Watch for local collection programs that will take back unused medications and dispose of them properly. You can also visit the Drug Enforcement Administration (DEA) website for information about controlled substance public disposal locations. Always remove all personal information from the prescription label on your medication before throwing away the container. Hy-Vee Pharmacy solutions (HPS) is here to help you organize your medication cabinet and make it easier to manage chronic, complex conditions. If you have questions about what medications to include in your medicine cabinet, HPS can help. With HPS, you have the benefit of seamless coordination between HPS specialty pharmacy services and the exceptional retail pharmacy services offered at your local Hy-Vee store. You can also visit HPS Des Moines for convenient access to over-the-counter medications and specialty pharmacy services.